It’s usually easy to wander into a gallery; you can step inside, browse around, and leave as quickly as you entered. Unfortunately, Gallery X isn’t convenient to meander into. Secluded on the second floor of the Visual Arts building, it goes unseen by most students, despite the affordable coffee shop and art-filled walls. 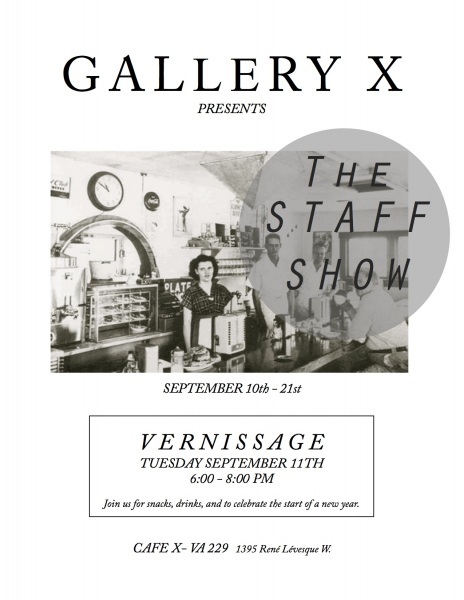 However if you’re feeling up for the venture, Gallery X’s first show of the year, The Staff Show, started this week, and it’s sure to entertain your eyes after long hours of staring at new class schedules. “It’s always good to have something broad for the first show of the year. You don’t get a lot of work at the beginning, because people don’t have any ready this early and they usually don’t want to show stuff from last year,” says Amanda Craig, a studio arts student and co-curator of Gallery X. According to Craig, The Staff Show is made up of artwork done by artists who work and run Café X. “For at least three years, the first show of the season is work by Café X staff. It’s great because students see them on a regular basis, serving coffee, but the show helps give a better idea of who they really are,” says Clinton Glenn, an Art History student who is back for his second year curating Gallery X. All shows at Gallery X last two weeks, so Glenn and Craig recently called for submissions in preparation for the second show. Submissions are generally accepted at the beginning of the fall and winter semester, but they take art submitted later as well. Gallery X also received a modern makeover over the summer. Last year’s teal and red walls, which Glenn describes with some distaste, have been repainted in warm beiges and spicy greens. With perfectly matched furniture that’s comfier than it looks, the space is looking sharp for the upcoming school year. The Staff Show will have their vernissage on September 11 from 6-8pm. Snacks, drinks, music and fun will be plentiful.